Here's a neat piece. It's a first shot of the Emperor figure. By themselves, first shots usually aren't amazing pieces; but this one is pretty notable for its colors-- it was shot in plastic that was substantially different in color from that eventually used to mass-produce the figure. 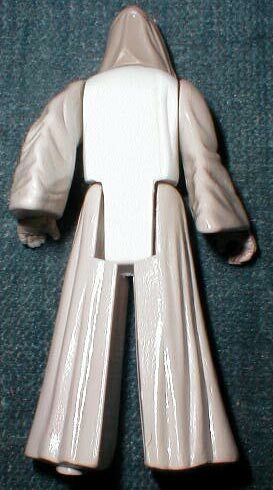 Where the production figure was shot entirely in a dark gray plastic, this prototype has a white torso and light gray limbs and head. 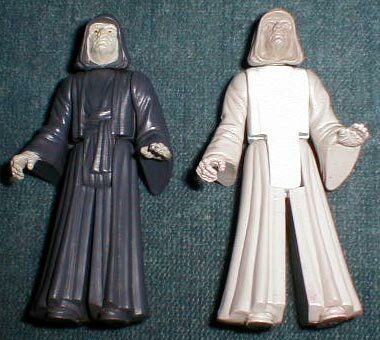 Also note the legs of the prototype figure-- they bend outward, which makes the poor Emperor look bow-legged. This happened because the PVC plastic used to mold them is slightly more flexible than that used during production. Here's the reverse. It doesn't have the date or copyright details molded into the back of the leg. Although I don't have a photo of the figure in a disassembled state, it should also be mentioned that its torso halves were never sonic welded together, and thus the entire figure can be taken apart.